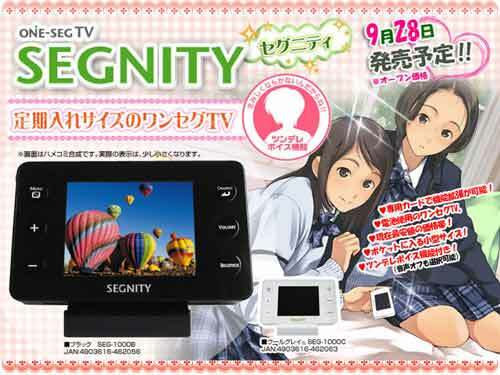 If there’s a product as bizarre as the Segnity pocket television from E-Revolution then we’ve yet to see it. After all, how many other gadgets come pre-programmed to mouth off to you every time you use them? The 2.7in QVGA television is of the massively popular digital 1-seg type that we’ve seen in dozens of Japanese devices so far – it receives broadcasts tailored for small-screens and these include text information as well as broadcast shows. Where it flips the bizarre-o switch, however, is with the inclusion of a range of different modes - ranging from ‘polite’ to ‘sharply sarcastic’ - governing how it responds when you operate the controls. For example, turn the volume up in one mode and a cartoon-like voice from the Segnity pipes up, “Noisy, aren’t you?” Adjust the screen brightness and it might comment, “Not bright enough for you, eh?” Fortunately, polite mode means quips are limited to straightforward barks of compliance. As for the dimensions – as if anyone buying a gadget like this will actually care – the ¥12,800 ($110) outlay secures a 90g device that runs for three hours on four AAA batteries or which can draw power from a USB port. It’s on sale next week and is a stone-cold certainty to never be sold in the West. Oh, and there’s a video here for the entertainment of the Japanese speakers among you.